Designing a meeting space where visitors or workshop participants can gather around an instructor or guide in your permaculture site or community garden enables effective communication. This is not legal advice and reference to legals is based solely on the author’s understanding and interpretation of law. 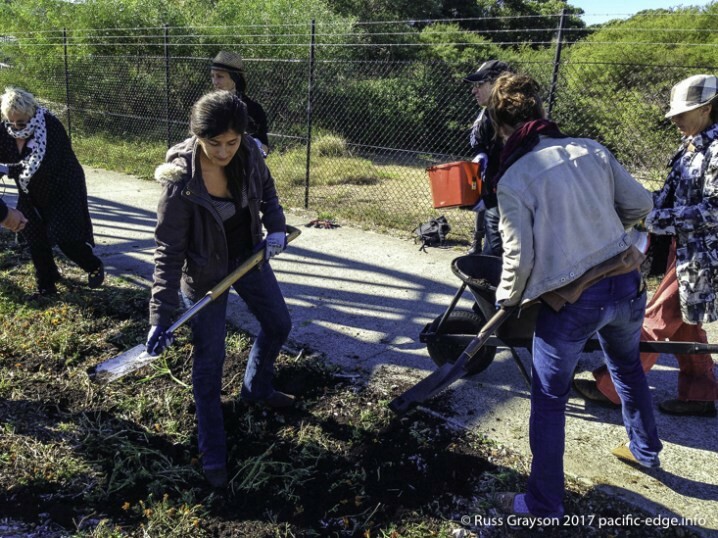 The article is of primary interest to organisers and leaders of activities on permaculture, community garden and similar sites. Permaculture practitioners are legally liable for the consequences of their works. COURSES, WORKSHOPS AND TOURS of properties have for a long time been a popular means of permaculture education. They make use of both intellectual learning-by-understanding and kinaesthetic learning-by-doing. The law impinges on those activities just as it does in other areas in our society. This briefing note takes a non-lawyer’s look at what that implies for how we conduct activities on our rural properties, in our community gardens and in our urban backyards. Owners, managers, workshop leaders and guides at sites used for permaculture and community garden tours for educational purposes should seek risk-minimisation and legal advice from qualified practitioners. workshop leaders and tour guides leading visitors through permaculture education centres. properties and community gardens. 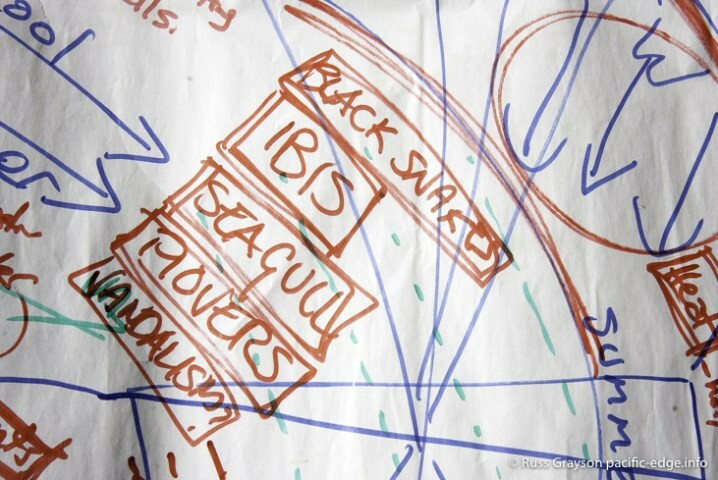 Duty of care to site visitors starts at the site planning stage as in this site analysis sketch. Which of the things listed would constitute a potential danger for site users and visitors? We are teaching permaculture on a property or site we own or manage, or we are organising or leading a tour of a permaculture property or site. The property or site may be our own, it might belong to another person, be managed by an institution such a permaculture education centre or it might be a community garden. Touring sites is one of the means by which people learn about permaculture and community gardening through observation and experience. Site tours are long-established in permaculture and touring, learning and working on permaculture properties are established forms of permaculture education. works carried out on the property — construction, earthworks on farms and in community gardens, tools and machinery, dams and water storage, machinery. While we can warn visitors about objective risks, we can take practical action to minimise risk coming from tools, equipment, earthworks, structures and farm operations. When visitors and students of permaculture courses come on to a property or site we own, manage or lead tours through, we have a legal duty of care towards them. Although I know of no legal cases stemming from a failure to carry out that duty of care, we live in a litigious society. This makes it in our own interest to ensure the property or site does not expose visitors or students to undue risk through negligence. 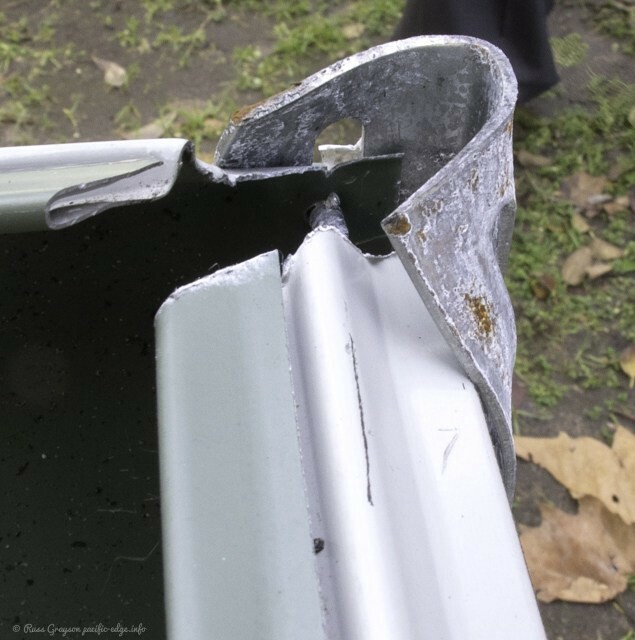 In this example of risk to visitors and community garden members, sharp metal edges have been left exposed at child-head height. The gardeners later fixed the edges. Attention to detail is important in minimising risk on sites open to the public. The law relevant to permaculture activities such as site tours, education or visitation is that of the tort of negligence. Injury to visitors or students or damage to their property might be due to carelessness or exposing them or their personal property to harm, damage or loss. Negligence may arise from conditions on the property or site that pose a danger to people or their personal property. The property owner, manager or tour guide may be negligent in maintaining the property in a safe condition. This could include failure to safely store sharp tools and other equipment, leaving paths in poor condition such as could cause a fall, or allowing access to water bodies in such a way as could risk people falling in. A tort, in common law jurisdictions, is a civil wrong that causes someone else to suffer loss or harm resulting in legal liability for the person who commits the tortious act. The property owner, manager of tour guide has a duty of care to visitors in regard to their safety, and breach of that duty could constitute negligence. 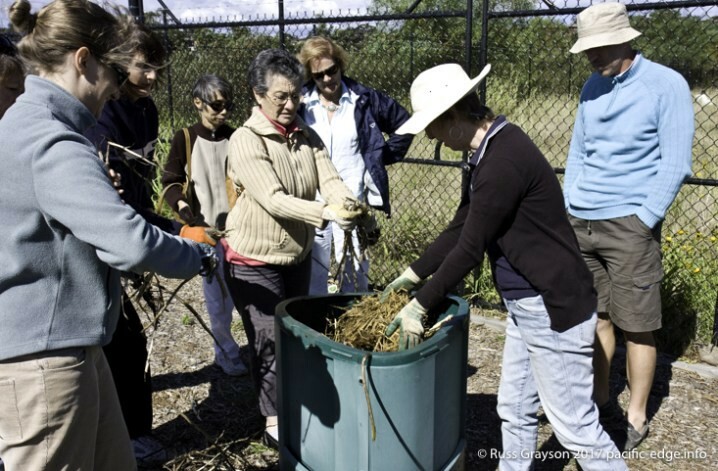 Participants wear gloves for handling composting materials and enclosed shoes in an organic gardening course. It is a good idea to ask participants if any suffer breathing difficulty. If so, issue them with dust masks when working with compost or mulch. Safety precautions like these reduce the possibility of injury. People sometimes mention a ‘fear everything’ approach by local and other levels of government that inhibits what we would like to do. Accepting our duty of care does not mean we become safety-obsessives. It is really an expression of concern for the wellbeing of visitors to our property and students on our workshops and courses. leading activities of a type that would be appropriate to the abilities of those undertaking them; are people physically capable of doing something? do they have the skills? are they appropriately equipped? have they been briefed about the safe use of tools and equipment? planning for foreseeable possibilities; what could go wrong and how do we avoid that through design or advice? being up to date in our knowledge of current standards and guidelines for the activities we would engage people in; is what we do current practice? asking visitors to bring a hat for protection from the sun and to wear covered shoes (not sandals). warning visitors through signage and/or verbally of any hazards or risks. Even where the site owner, manager or guide has visitors sign a waiver to negate their recourse to law for damages to person or property, it may be possible for plaintiffs to argue that the site owner, manager or guide retains liability through not addressing risks that were reasonably foreseeable. Provide a briefing in the safe use of tools at the start of a workshop. Include where to place tools when not in use — off paths and with the sharp edge facing down — and having enough space to use the tools without bumping into other gardeners. 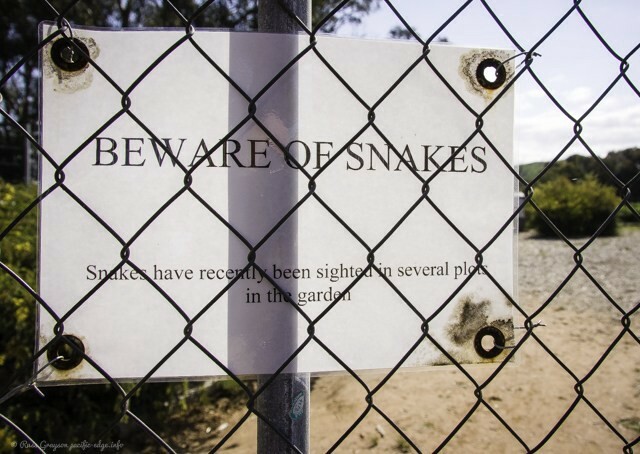 This sign provides due notice of a potential danger in a community garden and illustrates the type of precaution site managers can take to reduce risk.